Every person in this world desires a stress free life of peace and happiness, but our culture is based on how much we can achieve and how far we can go. It is easy to become overwhelmed and fatigued, with the lives we lead today. Our bodily systems become compromised, resulting in us becoming ill more often. Restorative Yoga offers us a nurturing space, where we can heal and balance our physical, mental and emotional symptoms more effectively. Restorative Yoga has it’s background in the work of Guruji B.K.S Iyengar, who pioneered the use of props to help support the body in yoga postures. The use of props in restorative yoga, allows you to hold postures longer, giving you all the benefits of deep relaxation and passive stretching. These long held postures allow for release of deeply held stresses in our fascia and connective tissue. Postures and props are modified to suit each individual for maximum comfort, so that the body is supported optimally; encouraging greater energy flow and relaxation. In Restorative Yoga, we consciously and mindfully, with the use of breath work, release our tension. As the breath is allowed to flow freely through our entire body, a lighter, energized and balanced self emerges. This experience takes you to a more subtle and refined practice, where presence of mind and body are needed. The benefits of Restorative Yoga are profound! – It offers overall support to the nervous, lymphatic, hormonal, endocrine, cardio thoracic and immune systems in the body. Restorative Yoga brings you back into harmony with your body’s natural rhythms, giving you an opportunity to rejuvenate, rest and heal on every level. Nalini teaches restorative yoga at the Durban Yoga Shala Friday mornings 8.15- 9.30am. Come learn how to relax deeply in order to heal on every level. This yoga workshop aims to enhance your knowledge and experience of inversions. Great for beginners and those already practicing Yoga. Learn specific conditioning poses to develop the strength and gain confidence to practice inversions, safely and effectively. Learn how to integrate inversions as apart of your self-practice at home. Gain understanding of the correct activations and techniques to facilitate alignment and balance in these calming and rejuvenating poses. Learn in detail the shoulder stand cycle and the foundations for a solid head stand. Practice handstands and forearm balances. This Friday be a part of a community inspired by the holistic and authentic practice of yoga. I will share insight into the experience of attending Geetaji Iyengar’s 70th birthday celebration in December 2014- an intensive ten day yoga conference in Pune, India. The conference welcomed a 14 teachers from South Africa, including Nalini and myself who teach at the Durban Yoga Shala. 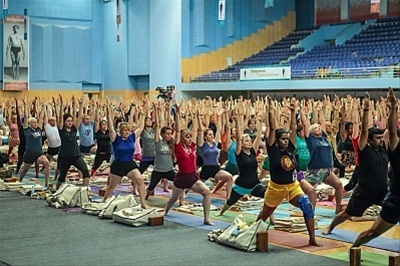 Over 1200 yoga students and teachers from 57 different countries were present to celebrate life and yoga through the Iyengar’s teachings. Below is a photo showing about one fouth of the participants. 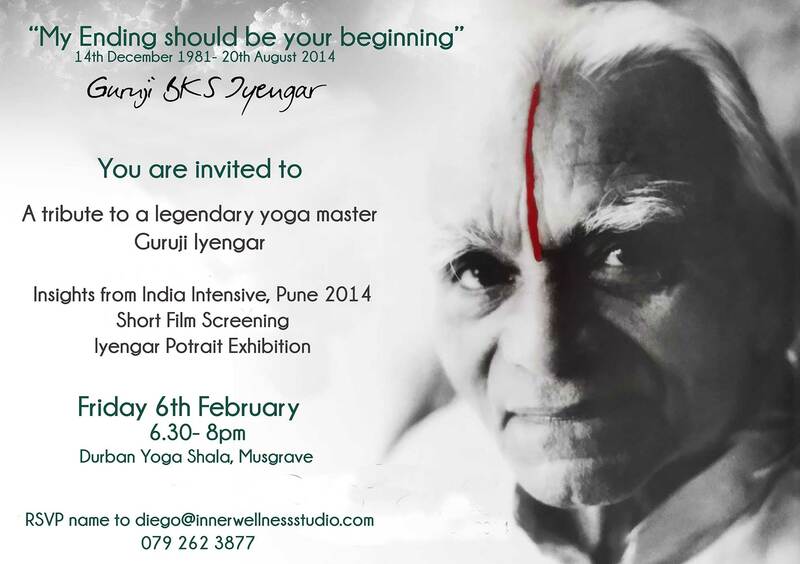 There will also be a 22min screening of the preview of “Sadhaka: the yoga of B.K.S Iyengar” , a feature documentary film about Guruji Iyengar’s yoga practice, life and influence. Thank you for choosing the centre for your yoga practice. Yoga is an ancient practice that brings the body, mind and spirit into union. It is this aspect of yoga that sets it apart from other forms of ‘exercise’. Yoga brings health and vitality to the body through the practice of sequences of asanas or postures. These asanas lengthen and strengthen the muscles, improve joint flexibility, tones the body and improves your posture and balance. The emphasis on the breath during postures helps improve your stamina. Yogic breathing is in itself meditative and helps bring your mind into union with your physical practice. The mental and emotional benefits of yoga include improved clarity, concentration and mental stamina. We learn how to release tension, and our impatience and egotism gently unravel as we surrender into a posture. Yoga can be practiced by people young and old, persons fit and flexible and especially those who consider themselves unfit and not flexible. Come as you are and you will discover the benefits of yoga. You will learn to work with your limitations and move beyond them. Our yoga classes are suitable for students new to yoga and experienced practitioners. Please approach your yoga practice in the spirit of ahimsa (nonviolence, non-harmfulness). Yoga is non-competitive. Be mindful of your body’s limitations. Each day is different and you may not be able to achieve a posture today that you performed last week. Being mindful will help you prevent unnecessary injuries. It is in this spirit that we at the Durban Yoga Shala bring our yoga teaching to you.